What’s Driving Your Agency’s New Business? Sound familiar? If you’ve sent us a new submission over the past several months you’ve probably received a phone call from Tony. In an effort to better understand and measure our marketing efforts, we started with the basic question of why? The MGA business model doesn’t lend itself to receiving market feedback directly from insureds, making it challenging to determine the effectiveness of marketing campaigns. That’s where Tony comes in. But before we get to that, let’s look at a seemingly simple question: What’s driving your agency’s new business? Any agency principal will tell you they want to drive new business. Few can tell you, with certainty, the most effective and efficient way their company can do it. As technology continues to advance, insurance companies and agencies are developing best practices for defining the source(s) of their new business and identifying the areas where they should expend additional resources. Now you’re probably thinking “That sounds great, how do I get started?” There isn’t a specific formula that works for every company, but here are a few processes that McNeil & Co. is currently implementing to determine how we can help our agents write more business across all our specialized programs. Agency management systems are an independent agents best friend. There are dozens of products available, but how can you ensure you have the right system for you? Every agency’s budget is different and their specific needs will vary greatly. Resources like Capterra and G2 Crowd provide compiled lists of products available and the features they offer so you can find the perfect solution for your agency. One function that can’t be overlooked is customer relationship management (CRM). In late 2016, McNeil & Co. started using Microsoft Dynamics as our CRM tool; the primary hub for our marketing and sales efforts. With up-to-date account information all in one place, we’ve been able to better interact with you, our appointed agents. Dynamics also allows us to more accurately measure the effectiveness of our marketing campaigns. This is vital to forecasting future marketing efforts and ensuring we are deploying the right amount of time an personnel on each campaign. Make sure that whatever agency management system you choose allows you to attribute your leads to specific efforts from your marketing or sales team. This will help you guide the client through the sales process and aggregate data on what strategies effectively drive new business. Most CRM tools come with default Lead Source fields like Advertisement, Cold Call, Web, Referral, and Other. Obviously, these defaults won’t perfectly encompass your efforts, but while you edit the list try not to create too many Lead Source options. The point of this designation isn’t to drill down to the specific action that led to the sale but rather to discover how that prospect was found in the first place. Meet with your team and brainstorm where prospects are coming from on a 30,000ft level. For reference, our Lead Source fields are Partner Referral, Advertisement, Cold Call, Trade Show, Web, Email Marketing, and Direct Mailing. If the Lead Source covers the 30,000ft view of where leads are coming from, campaigns reflect specific efforts that lead directly to an opportunity to quote and help illuminate the customer journey. Create a specific campaign for all your marketing and sales efforts, attaching any contact that is touched in these efforts. Attending a trade show? Create a campaign. Placing an ad in an industry publication? Create a campaign. Sending an email blast to a segmented group of prospects? Create a campaign. By the time an opportunity to quote comes about, a lead may have been contacted during multiple campaigns. That’s okay! 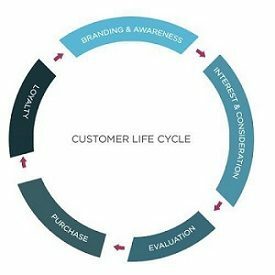 This is all part of the customer journey and can help paint the picture of your customer lifecycle. When a submission comes in, the who, what, and when are already defined. But what about the where and the why? That’s where Tony Blackwell comes in. As we continue to work on our own CRM workflows, Tony has been tasked with discovering where new opportunities came from and why they were submitted to McNeil & Co.
Was it a customer you met while attending a trade show with one of our employees? Did someone from your office attend our McNeil University producer training? Whatever the answer, the where and why can help us tailor our marketing efforts to support you, our appointed agents. As we continue to improve our marketing and sales workflows, agent communication will remain a key focus of our overall efforts. As such, we open the floor to you. Have any thoughts on how we can help you generate more leads and write more business? Let us know! Email socialmedia@mcneilandcompany.com with any feedback you have.